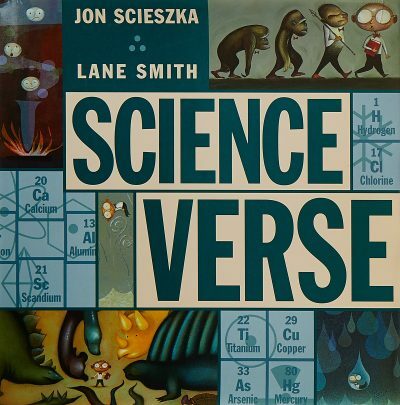 OVERVIEW: Scieszka and Smith join forces again, this time to bring science to life through poetry. This book will entertain younger readers and provides a great stimulus for discussion. It’s also a great way to engage those budding scientists who are reluctant writers! DESCRIPTION FROM THE PUBLISHER: What if a boring lesson about the food chain becomes a sing-aloud celebration about predators and prey? A twinkle-twinkle little star transforms into a twinkle-less, sunshine-eating-and rhyming Black Hole? What if amoebas, combustion, metamorphosis, viruses, the creation of the universe are all irresistible, laugh-out-loud poetry? Well, you’re thinking in science verse, that’s what. And if you can’t stop the rhymes . . . the atomic joke is on you. Only the amazing talents of Jon Scieszka and Lane Smith, the team who created Math Curse, could make science so much fun.